Have you ever been stranded by a car that just broke down? Were you left stranded in a parking lot or on the side of the road? I can speak from personal experience that sitting in a hot car while traffic zips by is a little unnerving. Most of the drivers who flew past must surely have their pilot’s license. My brother, Michael, came to the rescue. He was headed out to do some grocery shopping so he swung by and scooped us up and dropped us back at the house. We used my husband’s truck and went on our way again. My brother brought his truck and trailer to our house and the three of us headed out to gather up my car. My job was holding the spotlight. 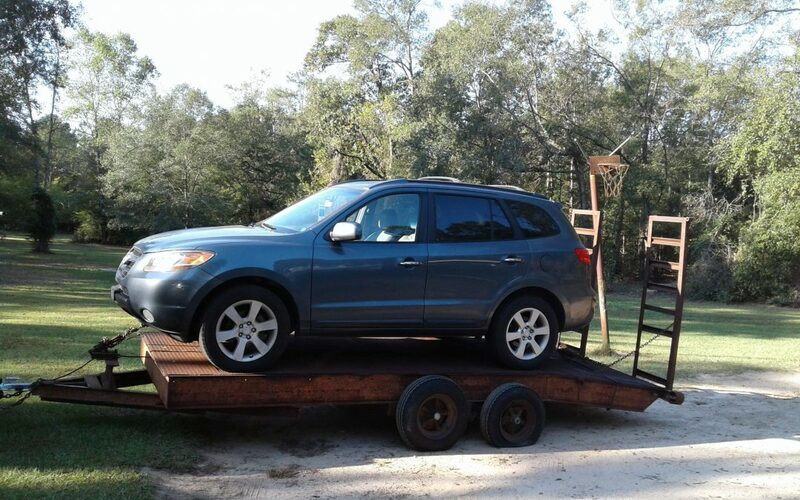 Thankfully, the car would crank and run just long enough to drive it up on the trailer. It was chained in place and we drove home. The adventure wasn’t over. Michael decided to get off the interstate and take a two-lane road home. Everything was going well until the headlights on his truck quit working. The first time the lights went out, we weren’t sure about it. There was oncoming traffic and enough light to see the road. Then, as we proceeded down Friendship Church Road, the headlights quit again. This time, there was no mistaking it. There are no streetlights out here and when the headlights failed, it was dark. Dark like pitch-black, where’s-the-road, Lord-what-do-we-do-now…DARK! My brother pulled a small flashlight out his pocket and let it shine through the windshield and onto the road. All the way home, then, it was headlight, flashlight, headlight, flashlight…. Until next time…we will track down the parts and be grateful for all the blessings that come from my Heavenly Father; flashlights included.